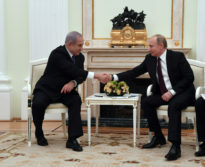 PM Netanyahu with Russia President Putin. 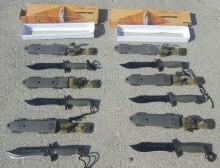 Photo Courtesy of Israeli GPO. 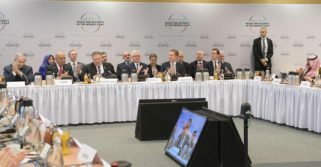 A senior official in Iran warned that the approach in 2019 to Israeli attacks on the “Axis of Resistance”—presumably Iran, Syria and terror groups such as Hezbollah—would be “significantly different from the combat methods in the past.” Secretary of Iran’s Supreme National Security Council Ali Shamkhani made the comments in an interview with the Tasnim News Agency published on Saturday, where he also claimed that the Axis achieved “more than 90 percent” of their goals in Syria, a claim that Israeli Prime Minister Benjamin Netanyahu denied a day alter. “This is incorrect,” said Netanyahu of the Iranian assertion, according to comments published by his office on Sunday. “It is correct that they are trying and it is correct that we are blocking them. Last month another Iranian official said that they are only ‘advising’ Syria. The world hears very many Iranian lies. 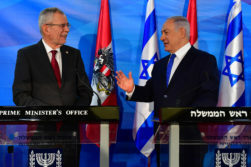 It’s a busy season of diplomacy for Israel against Iran, as Prime Minister Benjamin Netanyahu was in Poland last week for a conference with Arab and Western nations discussing the threat from Tehran, and this week he will be in Poland’s neighbor Russia to discuss how to keep combatting that threat. 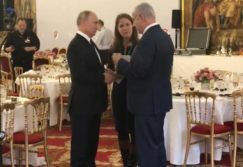 Netanyahu, in comments on Sunday released by his office, said he would be in Moscow on Thursday to meet with Russian President Vladimir Putin and converse on “the continued strengthening of the coordination mechanism in order to prevent friction between the IDF and the Russian military” in Syria. Israel has repeatedly bombed targets in Syria in an effort to keep Iran and it’s terror ally Hezbollah from expanding their threat against Israel in the north. Russia is also militarily involved in Russia acting on behalf of the Syrian regime in the civil war there, making coordination key to avoid direct conflict between Israeli and Russian forces. The United States and Israel seem to be speaking each other’s language in a lot of ways when it comes to peace in the Middle East. 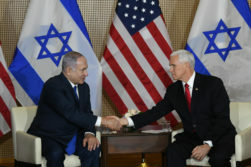 On Thursday, while at the US sponsored Warsaw Conference on Peace and Security in the Middle East, Israeli Prime Minister Benjamin Netanyahu expressed enthusiasm for the anticipated “Deal of the Century” peace plan by the Trump Administration during a meeting with US Vice President Mike Pence. Just hours earlier, US Secretary of State Mike Pompeo took a line from Netanyahu’s talking points when he said during a meeting with Netanyahu that “you can’t achieve peace and stability in the Middle East without confronting Iran. A murder of an Israeli teenage woman, described by Israeli Prime Minister Benjamin Netanyahu as being done with “shocking brutality”, was solved within hours as the Palestinian behind the attack was arrested by Israeli security forces last week. Netanyahu confirmed on Sunday that the investigation determined the incident was an act of terrorism, according to spokesperson Ofir Gendelman’s Twitter feed. That tweet said Netanyahu personally relayed the conclusions on the murder’s motive to the family of Ori Ansbacher, the 19-year-old who was killed last Thursday in a forest in Jerusalem.